Landscape Design Samples from Start to Finish, See the Plan Become Reality! View the Landscape Design Samples. The before pictures show the challenges of the project. The plans outline the course of action. The pictures of the completed job show you what the plan looks like once installed. You can see a complete transformation! A Landscape Design is a plan of action! It communicates what is to be done to build your outdoor environment. The contractors involved in the project must be able to interpret the plan, so they can give you a correct estimate and then use the plan for the construction phase of the project. It is essential that the plan be clear and easy to read by everyone involved. The plans shown on this page are reduced in size to accommodate the web. The actual drawings are 2 feet by 3 feet in size, have a plant list and any other details and notes necessary for the job. I have cropped the plan to show the part of it that is represented in the photographs. Unfortunately, at this small size the labels and notes are not legible, what I want you to see is however! Look at how the shapes on the flat plan translate to the after picture below it. BEFORE- The trees are important to this property, but they are just covering up too much of the house. The driveway is cramped. The small circle in the front of the house is too tight to accommodate a UPS delivery truck! The overall street appeal and making the driveway more attractive and functional is what needs to be accomplished here! 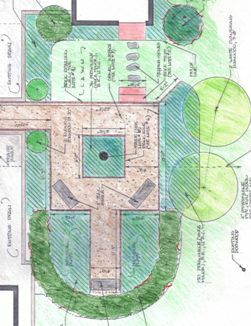 This is the section of the landscape design that shows the plan view (view from above looking down) for the after picture below. The gray/tan colored area is the new driveway with a cobblestone edge. The pink colored area is azaleas and the green circles are the dogwood trees dotted in front of them. The plan specifies what trees are to come out which is shown by the black dots with x's on them. This landscape design sample shows how the project has changed.The street appeal of this house is magnificent! Viewing the house now is easy. Only small trees that are growing under the big ones are removed. Thinning the trees actually lets the larger trees have more room to grow stronger. 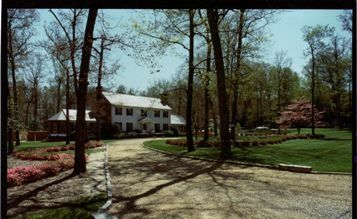 The driveway is easy to navigate with parking to one side and a wide entrance that allows two cars to pass by the front door. The cobblestone edge is a nice visual detail and helps keep the gravel out of the lawn. 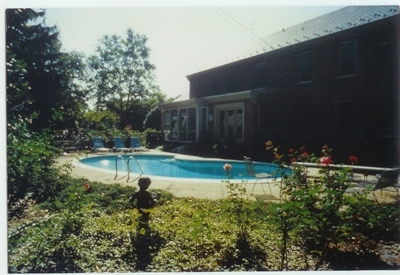 BEFORE - This circa 1960 gunite swimming pool has a small, cracked,plain concrete deck, chain link fences covered in English ivy and planting that is overgrown and tired. The pool shape is timeless. The things around this pool need updating and improving, so the owners have a more impressive and usable outdoor room. 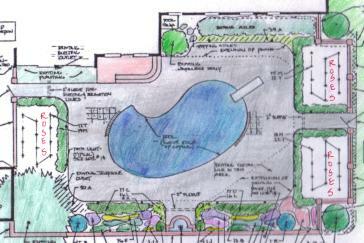 In this landscape design sample, the existing pool is colored turquoise blue. 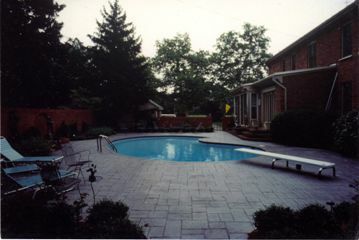 The gray area around the pool is the new pool deck of decorative, patterned concrete. It has been enlarged and reshaped to better accent the pool, line up nicely with the new wall fountain and to provide more usable space. There is a dotted line that shows where the original pool deck was located. The squares on each side of the drawing represent the rose beds. They are bordered with dwarf evergreen shrubs for formality and year-round interest. The new brick walls that took the place of the ivy-covered, chain link fence are shown by the brick colored line surrounding the pool area. 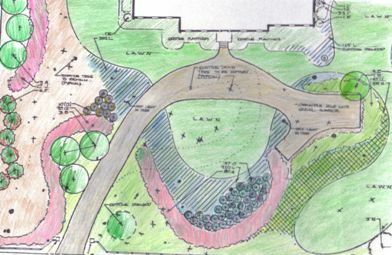 Multi-colored sweeps in front of the wall at the bottom of the plan represent the mix bed of shrubs and perennials. A wall fountain and reflecting pool are in the center of the long stretch of wall. AFTER-The brick walls create privacy and are a natural extension of the brick house. The coping around the pool now matches the pool deck which is an updated style. An enlarged pool deck is much more comfortable and accomodates plenty of furniture. The pool coping now matches the deck. The pool looks so much better without the white line around it! BEFORE- This is the perfect place to have a memorial garden at this church. 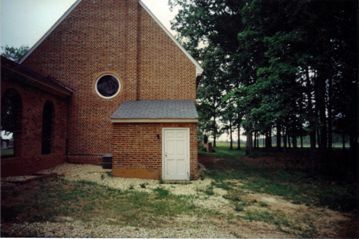 It is immediately off the covered walk that connects the church and parish house. This landscape design sample has its challenges, but they can be overcome! The square that is colored blue-green has a statue of an angel in the center represented by the black dot. 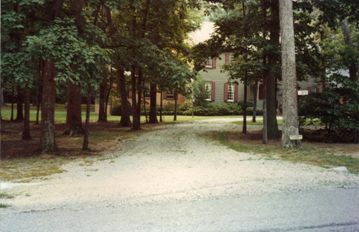 A gravel path (colored brown on the drawing) leads from the covered walk and around the center bed. Another length of the path takes the visitor to a bench that is backed by a mass of evergreen shrubs (represented by the dark green half circle at the bottom of the drawing). The path is edged in brick that is shown by the brick colored line. A brick retaining wall runs along the top of the large, brown square to make the area level. For continuity, the top of the retaining wall is capped to match the path's brick edge used throughout the memorial garden. Notice the two red rectangles at the top right corner of the large, brown square. They are steps to get down to the ground level that allows access to the back door. This door is seen in the before picture. This statue is a hand carved angel from Italy. It is exquisite! A peaceful and serene feeling is created by it. This feeling extends even to the pedestrians traveling along the covered walk. You can see how much the area needed to be raised to level it. The garden would not have functioned without a retaining wall. 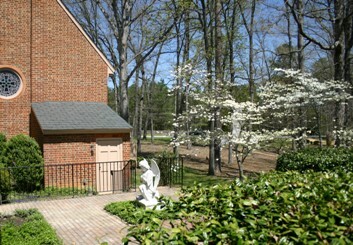 The two dogwood trees are now 20 years old. On the plan they are the two bright green circles on the right. A landscape plan produces results! It is the first step in transforming an unattractive or unusable space into something to be admired. Contractors use it to calculate material amounts, give you an estimate and build the project. The plan can be as simple or complex as the project demands. Just remember, a well-thought out plan gives you a landscape that grows more beautiful each year! Are you struggling with a landscape design issue? I'd like to help! Ask a question and get a quick response. See the question and answer get its own page on the site for you to share with our readers and your friends. I hope to be hearing from you!